"Ski station" redirects here. For the railway station at Ski in Norway, see Ski Station. A ski resort is a resort developed for skiing, snowboarding, and other winter sports. In Europe, most ski resorts are towns or villages in or adjacent to a ski area – a mountainous area with pistes (ski trails) and a ski lift system. In North America, it is more common for ski areas to exist well away from towns, so ski resorts usually are destination resorts, often purpose-built and self-contained, where skiing is the main activity. Developed around a well-established summer resort or village (e.g. Davos, St. Moritz, Kitzbühel, Chamonix, Megève, Val Gardena). Created from a non-tourist village or pasture (e.g. St. Anton, Lech, Courchevel, L'Alpe d'Huez, Aspen, Breckenridge). Designed from scratch on virgin territory to be a purpose-built ski resort, all the amenities and services nearby (e.g. Sestrière, Flaine, La Plagne, Isola 2000). Created from virgin territory or around an existing village, but more concerned with traditional uses (e.g. resorts built since 1975 like Shahdag Mountain Resort, Azerbaijan). 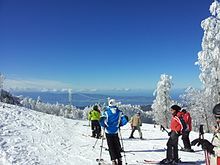 The term ski station is also used, particularly in Europe, for a skiing facility which is not located in or near a town or village. A ski resort which is also open for summer activities is often referred to as a mountain resort. Some ski resorts offer lodging options on the slopes themselves, with ski-in and ski-out access allowing guests to ski right up to the door. Ski resorts often have other activities, such as snowmobiling, sledding, horse-drawn sleds, dog-sledding, ice-skating, indoor or outdoor swimming, and hot tubbing, game rooms, and local forms of entertainment, such as clubs, cinema, theaters and cabarets. Après-ski (French: after skiing) is a term for entertainment, nightlife or social events that occur specifically at ski resorts. These add to the enjoyment of resort-goers and provide something to do besides skiing and snowboarding. The culture originated in the Alps, where it is most popular and where skiers often stop at bars on their last run of the day while still wearing all their ski gear. The process of resort development have progressed since the birth of the skiing industry. As the economic role of the skiing industry grew, the environmental impact of resort development has also caused environmental burdens on the natural ecosystem including mountain water levels of lakes, streams, and wildlife. Amenities and infrastructure such as concrete buildings, ski-lifts, gondolas, access roads, parking lots, and railways have contributed to the urbanization of mountainous zones. In recent years, the use of snow cannons has increased due to the fall in the volume of snow. In order to obtain good quality snow, dust or bacteria is mixed with the water in the process of snow making to form better snowflakes. Not only that the manufacture of artificial snow is costly and uses large amounts of water, but sometimes the creation of artificial lakes is necessary for the snow-making process. Snow cannons redistribute a large amount of water unnaturally over the land and freezes the ground vegetation late into spring, preventing growth and leaving pistes bare. With enough excess water, the likelihood of landslides and avalanches may be drastically higher. The required space for hotels, flats and secondary residences has increased the amount of space occupied by roads and buildings. While a large number of people requires special water, sewage and electricity systems, a great deal of construction work is needed. Access roads and the treatment of salt are responsible for high amounts of erosion at ski resorts. In some cases natural lakes must be tapped or reservoirs built to cater for the population demand. The urbanization of mountainous areas have increased the space of impervious surface, and prevents the natural flow of water into the ground, resulting in a disturbed water table and potential cause of erosion in undesired places. Lastly, when building ski lifts, its line of operation must be shaped and drained, and large concrete blocks must be set down for pylons. If the pylons are not carefully placed, it could cause damage to surface vegetation. ^ "Definition of après-ski". Merriam-Webster. Retrieved 26 November 2012. ^ Lund, Morton (March 2007). "Tea Dance To Disco. Après-Ski Through the Ages". Skiing Heritage Journal. 19 (1): 6–12. Retrieved 26 November 2012. ^ Harper, Douglas. "ski (n.)". Etymology Online. Retrieved 21 November 2014. ^ a b c d Chivers, John (1994). "Effects of the Skiing Industry on the Environment" (PDF). School of International Studies and Law, Coventry University.